Simple cross-platform distributed computing, based on the standards of the Internet. "Does distributed computing have to be any harder than this? I don't think so." -- Byte. The implementations page lists the accomplishments of the community, a set of compatible XML-RPC implementations that span all operating systems, programming languages, dynamic and static environments, open source and commercial, for Perl, Python, Java, Frontier, C/C++, Lisp, PHP, Microsoft .NET, Rebol, Real Basic, Tcl, Delphi, WebObjects and Zope, and more are coming all the time. The services page lists the next-level-up, public applications, or "web services" that are accessible through XML-RPC. The communities page tries to organize all the activity around XML-RPC on mail lists, websites and search engines. Finally, the tutorials/press page points to articles written about XML-RPC. Read Eric Kidd's fantastic XML-RPC HowTo. Join the mail list, or become a member of this site, and post an introduction or ask a question. Each page with links in this directory has an easy Suggest-A-Link feature, look towards the bottom of the page, click the link, fill in the form, click on Submit. Test your implementation on the XML-RPC Validator page. See who's linking to us on the Referers page. 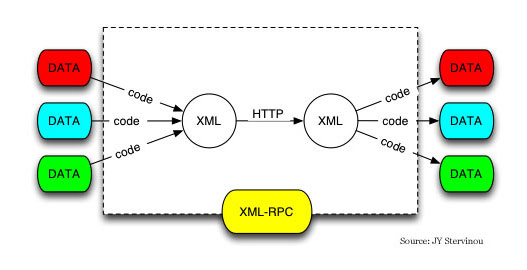 The first implementation of XML-RPC was in Frontier, in April 1998. © Copyright 2004-2011 Scripting News, Inc.
© Copyright 1998-2004 UserLand Software, Inc.
XML-RPC is a trademark of UserLand Software, Inc.
Posted: 6/14/99; 7:58:47 PM Pacific.